Grant Youngblood sang Samuel Barber’s Dover Beach (written for voice and string quartet). His warm, even tone and excellent diction beautifully conveyed the music and the text. The poem, by Matthew Arnold, was brought to life by the quartet, whose music ebbs, flows and crashes like waves on the beach. Though the poem is English, we mustn’t forget Barber grew up in West Chester, Pennsylvania and was one of the first graduates of the Curtis Institute of Music. How fortunate were we to be able to hear Mr. Youngblood in one of his rare local performances! 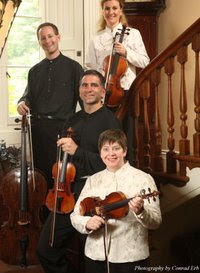 The Quartet played Felix Mendelssohn’s String Quartet in A minor, Op. 13. with gusto. Mendelssohn wastes no time, diving immediately into the brooding angst of the piece. The second movement is reflective and calmer than the first. It almost seems an explanation of the raw emotions that have been exposed. In the third movement, the gypsy-like motive lends some lightness to the quartet, but by the fourth movement, the original theme returns. After several deceptive cadences, Mendelssohn builds the tension until the very end. I was astounded to learn Mendelssohn had only been seventeen when he composed this quartet. He was in good, youthful company with the other composers featured in this wonderful concert: Barber was thirty-one when he composed Dover Beach and Mozart was twenty-nine when he completed his quartet in C major, K 465. Be sure to hear the Serafin String Quartet’s next performance on March 10 at 12:30 pm at First & Central Presbyterian Church in Wilmington!